Did you know that ice cubes were invented by a physician? In 1844, Dr. John Gorrie built the first refrigerator which produced ice. Interestingly, these ice cubes didn’t wind up in anyone’s Coca-Cola. At least not originally. The first ice cubes were used as a rudimentary “air conditioner”. It was believed that stifling rooms and “bad air” quality made people sick, and so the ice cubes were put in a basin and hung from the ceiling in belief that the cooling effect helped cure illness. Today we just like them in our drinks! Thankfully, I will not be suggesting you turn off your AC this summer and hang a bowl of ice cubes from your ceiling. 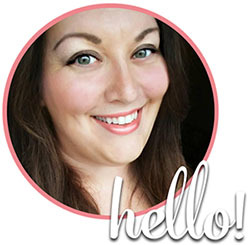 Though I might have to test that one out…. If you make your own organic baby food, then you already know its most practical to make larger quantities in bulk. Simply prepare the puree, then carefully spoon into each compartment and freeze. Each “well” in the tray is about two tablespoons. The cubes can be transferred into freezer bags, labeled and then thawed as needed. If you liked my Homemade Dishwasher Detergent, but had problems with it solidifying into one big brick, you can take the powder and press it into the ice cube trays to make dishwasher tabs! Just pack the powder in evenly and let dry for a day or two. Pop ’em out and store in an air tight container. No need to freeze. Harvest or purchase fresh herbs, chop into small pieces and place in the tray. Then fill the wells with olive oil and freeze. You will have the perfect starters you can toss right in your sauté pan the next time you cook. When you make a big batch of bone broth or stock, simply pour into the trays and freeze. Pop them out and keep them in a freezer bag and use a couple for flavoring your favorite dishes instead of bouillon cubes. Each “cube” is about two tablespoons. 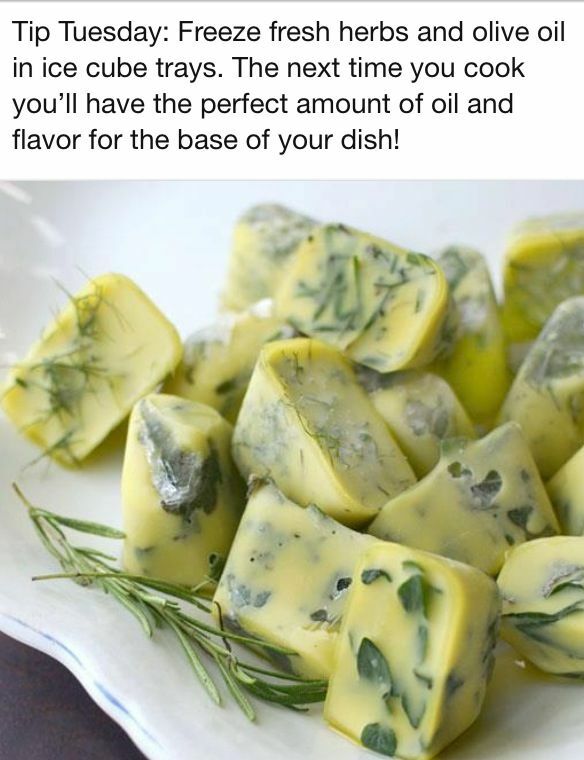 You could also freeze the broth with your fresh herbs instead of olive oil as described in #3 above. Freeze your favorite smoothie base into ice cubes. This makes for a thicker smoothie that stays colder than just pouring liquid in straight. Makes it more like a milkshake. Yum! If you’re into making soap you can make your own using ice cube trays as molds. Just don’t use the same ones for food products in the future! You can even find fun shaped ice cube trays for this purpose. Eggs can be frozen once they are removed from the shell. To freeze whole eggs, scramble then pour into the tray. This also works if you have a recipe that calls for just an egg yolk, you could freeze the white for use in a later recipe and vice-versa. Transfer to a zipper freezer bag once frozen. Freeze trays of aloe vera or after-burn gel for amazing cooling relief from sunburn. To use, allow to melt for a few seconds in the warm air, then apply gently to burned area. Do not hold frozen cube in one spot too long. Use empty ice cube trays to store tiny trinkets, itty-bitty craft supplies or small pieces of jewelry. Melt down bits of old crayons using a microwave safe bowl and pour into ice cube trays to make new, fat crayons perfect for little fingers. You can make them multicolored too for added fun! 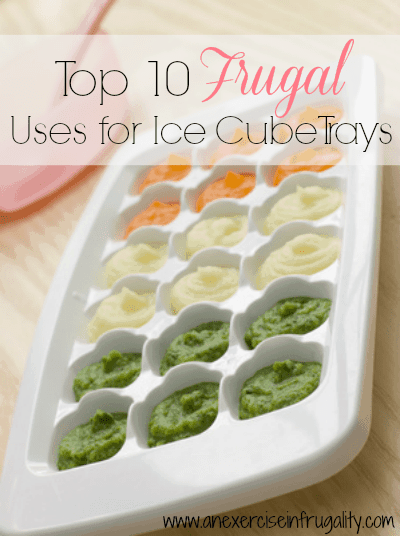 What’s your favorite frugal use for ice cube trays?